Further raising awareness and supporting fundraising campaigns for NMO research, a group of NMO Advocates has created NMOChat, a new website for sharing information, making online NMO content more accessible for sight-impaired patients, while also providing a forum for the patient community to discuss NMO. To learn more about NMOChat we asked a few questions to two of the creators, Ashlee Olsen and Robert Rubano. NMOChat is an online message board catering to NMO/SD patients and family members with questions or concerns regarding NMO and its treatments. The website works well with screen readers offering another way for the visually impaired to access information about NMO. There are also many other resources. What was the inspiration to create NMOChat? The inspiration behind NMOChat was to create a site that was easier to navigate for the vision impaired, with a wealth of information available for the screen-reading community. [Ashlee] I knew I would need more knowledgeable people to help. That is when I asked Grace Mitchell and Heather Sowalla if they would be willing to collaborate with me. To get the site up and running, I enlisted my childhood friend, Robert, to program the site. [Robert] It was then that I started learning about [NMO] and in my learning, I found that there was much to be desired regarding web for the vision impaired. What keeps you advocating and supporting fundraising for NMO research? [Ashlee] I advocate and fundraise to help us get one step closer to finding a cure. I feel if I can educate one person about the disease, which saves someone from becoming legally blind like I am, then I’ve done good. [Robert] I’m passionate about supporting the community as my friend suffers from NMO and it makes me so happy to be able to provide this to everybody. I do it to support my friend Ashlee as she has for many years meant the world to me. What is the goal of NMOChat? Ultimately we want this to be a way to bring the community together as a shared resource of scientific data as well as personal experiences. We want a way to provide the NMO patient community with a wealth of knowledge and network of support. What types of topics are posted? Topics are by broad categories of commonly asked questions or based on major studies done. As more studies are done additional topics will be made and conversation threads will allow people to read the source data as well as individuals’ experiences in each category. How can others educate themselves about NMO? [Ashlee] I know that being told you have NMO can be very scary. But remember you’re not alone you have a whole Community out there of support and life is not over. It’s just the beginning of a new Journey. [Robert] Join NMOChat, read the stories. Add your own. Ask questions of the community and become a part of the knowledge tree. What you may know a lot about, someone else may know nothing. By all of us coming together and sharing we can answer any question. Click here to visit NMOChat. Click here to visit Spectrum an online NMO research publication library. 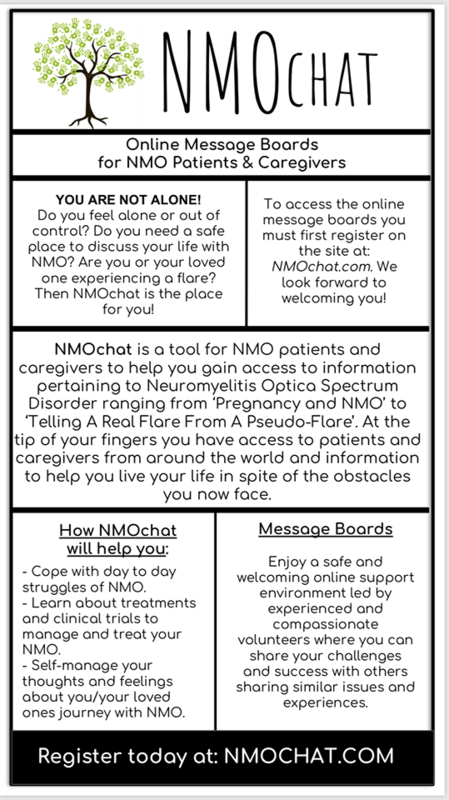 Download, print, or share the NMOChat flyer!